Successfully Added Wotofo Serpent Mini 25mm Rebuildable Tank Atomizer - Single And Dual Coil Deck, 4.5ml Tank, 510 Thread, Japanese Organic Cotton to your Shopping Cart. Meet the Wotofo Serpent Mini, a high-quality and powerful 25mm rebuildable tank atomizer (RTA) that comes with both a single coil and dual coil velocity style deck – assuring that it will meet the liking and style of all vapers out there. Crafted out of stylish stainless steel, this Wotofo RTA features a smooth, durable, and easy to clean design. Within its package, you’ll furthermore be able to find high-end Japanese organic cotton and all the tools needed to efficiently work with the Wotofo Serpent mini - allowing you to take the most out of all this beautiful rebuildable tank atomizer has to offer. Featuring an adjustable air flow design, the Wotofo Serpent Mini 25mm allows you to manually adjust the amount of flavor and vapor you receive while enjoying a relaxing vape. From now on you’ll be able to fully enjoy your upcoming vaping sessions as, with its adjustable airflow design, you’ll always be able to adjust your vaping sessions to your own personal liking. Simply fill up its massive 4.5ml tank with your favorite taste of e-liquid and you’ll be all set to enjoy countless tasteful vapes to come. Coming with a single coil and dual coil deck, this RTA kit is sure to meet the likings of all vapers out there no matter their style. Its simple design makes the Wotofo Serpent Mini 25 easy to dissemble – allowing you to efficiently change in between your single and dual coil decks. No matter which of its decks you will be using, both feature a massive amount of space that allows you to insert a large amount of cotton into your cores – ensuring that you’ll always enjoy the best taste experience out there while engaging in your upcoming vaping sessions. Being the perfect vape accessory for all the advanced vapers out there, this Wotofo RTA offers plenty of possibilities through which you can upgrade the performance of your current E-cigarette or vape mod kit. 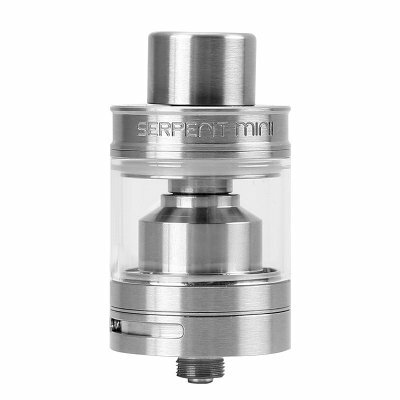 Not only does the Serpent Mini rebuildable tank atomizer produce great taste, it also produces massive vapor clouds that are sure to leave all your friends and people standing by in awe. Additionally, this RTA also comes with a gold plated 510 pin thread that provides you with great control over your vaping as it makes this RTA compatible with many other mods and kits out there. The Wotofo Serpent Mini comes with a 12 months warranty, brought to you by the leader in electronic devices as well as wholesale electronic gadgets..